Obama’s drone war: The “kill list” leaves out the real story. On the dark side of the drone war, Obama’s rules don’t apply. 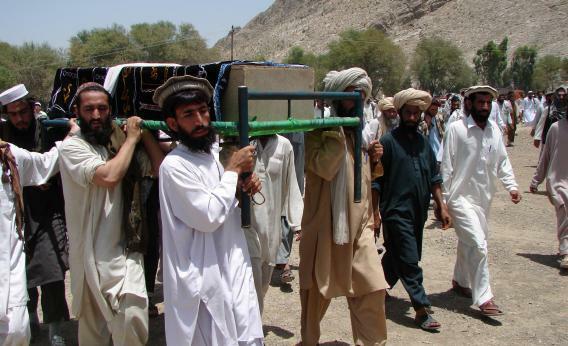 Pakistani tribesmen carry the coffin of a person allegedly killed in a 2011 U.S. drone attack. They claim that innocent civilians died. Photograph by Thir Khan/AFP/Getty Images. According to the New York Times, President Obama is up to his eyeballs in the U.S. drone program. He presides over secret meetings to decide who gets put on a “kill list” of terrorists targeted for strikes. He personally examines each nominee and issues the ultimate verdict. The story portrays a president deeply immersed in national security, determined to ensure that every strike is free of civilian casualties and that every candidate for assassination gets a fair hearing. It’s a flattering portrait. But at its margins, you can spot hints at what the official narrative leaves out. Obama has been using two enormous loopholes to evade the program’s rules for selecting targets and sparing civilians. The president expects us to address all of the tough questions. … Is this individual a significant threat to U.S. interests? … Our commitment to upholding the ethics and efficacy of this counterterrorism tool continues even after we decide to pursue a specific terrorist in this way. For example, we only authorize a particular operation against a specific individual if we have a high degree of confidence that the individual being targeted is indeed the terrorist we are pursuing. This is a very high bar. … Our intelligence community has multiple ways to determine, with a high degree of confidence, that the individual being targeted is indeed the al-Qaida terrorist we are seeking. In Pakistan, Mr. Obama had approved not only “personality” strikes aimed at named, high-value terrorists, but “signature” strikes that targeted training camps and suspicious compounds in areas controlled by militants. But some State Department officials have complained to the White House that the criteria used by the C.I.A. for identifying a terrorist “signature” were too lax. The joke was that when the C.I.A. sees “three guys doing jumping jacks,” the agency thinks it is a terrorist training camp, said one senior official. Men loading a truck with fertilizer could be bombmakers—but they might also be farmers, skeptics argued. overruled military and intelligence commanders who were pushing to use signature strikes there as well. … Obama had drawn a line. But within two years, he stepped across it. Signature strikes in Pakistan were killing a large number of terrorist suspects, even when C.I.A. analysts were not certain beforehand of their presence. And in Yemen, roiled by the Arab Spring unrest, the Qaeda affiliate was seizing territory. Today, the Defense Department can target suspects in Yemen whose names they do not know. Obama embraced a disputed method for counting civilian casualties. … It in effect counts all military-age males in a strike zone as combatants, according to several administration officials, unless there is explicit intelligence posthumously proving them innocent. Counterterrorism officials insist this approach is one of simple logic: people in an area of known terrorist activity, or found with a top Qaeda operative, are probably up to no good. “Al Qaeda is an insular, paranoid organization—innocent neighbors don’t hitchhike rides in the back of trucks headed for the border with guns and bombs,” said one official. … This counting method may partly explain the official claims of extraordinarily low collateral deaths. In a speech last year Mr. Brennan, Mr. Obama’s trusted adviser, said that not a single noncombatant had been killed in a year of strikes. And in a recent interview, a senior administration official said that the number of civilians killed in drone strikes in Pakistan under Mr. Obama was in the “single digits”—and that independent counts of scores or hundreds of civilian deaths unwittingly draw on false propaganda claims by militants. In short, the official tally of civilian deaths is low because Obama has reversed the burden of proof. Any man within the designated age range is presumed guilty and eligible for termination. Imagine what Obama would say if this defense were offered for the killing of Trayvon Martin. For the most part, Brennan is right about the drone program. It vets targets and spares civilians more effectively than conventional warfare does. And it’s great to read that Obama and his advisers carefully evaluate the kill list. But that portrait only shows us what’s within the frame. Outside the margins of the portrait lies a shadowy world of signature strikes and unknown victims, hidden by creative language. And what’s going on out there, we just don’t know.